My first born daughter just turned 4 and a half years. She had a bad flu last week and had to stay away from school for all 5 days. On Thursday, I boiled oxtail soup, put some in a mug and headed to the living room where both my kids were playing. The older girl was making a mess behind the couch while trying to pull her desk and I placed the soup on the table for a second to help her out. I’ve been regretting that decision ever since because as soon as I turned, I heard my 11 month old scream in pain. She had reached for the hot soup and poured it all over her chest. I cannot even begin to explain what happened next. I grabbed my baby, run to the bathroom where our housekeeper was doing laundry and had her help me undress the, now screaming hysterically, baby. I then cooled the burn with a wet towel, grabbed the car keys and rushed out with my half naked baby in one arm and her blanket in the other. I then drove like crazy hooting all the way to the hospital, took two stairs at a time because I felt like the lift was too slow for me and burst into the consultation room that was nearest to the door.When they asked what her name was, I was too confused to remember and I gave them my older daughter’s. It was only after she’d been given pain-killers and relaxed a little that I realize that my neighbors daughter was with me and that I was wearing my in-door shoes. Long story short, we were treated and discharged. We were given some Sulfur cream to be applying twice daily and painkillers. But here’s where it got interesting; she had to stay naked from the waist up for one whole week. Since all this happened in July (the coldest month in the year) I was afraid of a little more than wound infection. I also had to protect her from a cold, flu or even Pneumonia.Thank God I had the Ramtons Electric Heater that I bought the day she was born and have been using when giving her baths. The first thing I did when I got home was load 2,000 shillings worth of Tokens. I only got 108 units. Since I’d have to keep the room heated day and night, I expected the tokens to last for at most 3 days. As I’m writing this, it is day 8, the wound has dried almost completely, the heater has been on all this time and the tokens are yet to be exhausted. I’m however expecting them to be all gone any time now. This electrical appliance has been a life saver I have to say. I honestly do not think that she’d have healed this fast if I did not have it. There are times when you want to follow the doctors orders but what do you do when it is freezing cold and you have nothing else to do? You just layer pieces of clothing on your baby and the burn gets infected. I bought mine at a local supermarket but if you can’t get one where you live, you can order from Jumia Kenya and they’ll have it delivered to you. 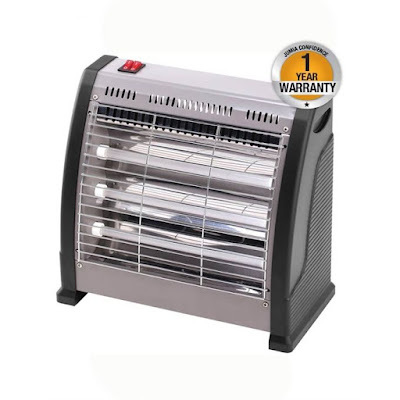 See the Ramtons Electric 3 Bar Quartz Heater on Jumia Kenya.